Edgar Allen Poe and the 2001 SuperBowl: What's the Connection? Just last week (1/19/2001) I heard of this strange connection on the local Bay Area radio news and I'd thought I'd share it with all of you New York Giants loyalists. BALTIMORE (AP) - He came upon a morning frigid. Six-foot-five and walking rigid. 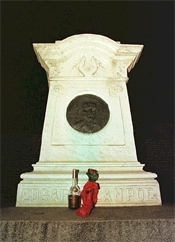 Carrying on a ritual that has remained shrouded in mystery for 48 years, an unknown visitor placed a bottle of cognac and three red roses on the grave of poet Edgar Allan Poe at Westminster Church in Baltimore in the icy darkness at 4:45 a.m. Sunday, Poe's birthday. This year's visitor held spellbound 15 Poe aficionados watching silently from the warmth of the church. The torch, passed two years ago to an apparently younger man, had been passed again, this time to a towering, lean gi ant, more daring and flamboyant than his predecessors. "Seeing this dark figure coming down the street with his cloak flowing, the wide-brimmed dark hat, all black - I don't think I will ever forget what I saw last night," said Jeff Jerome, the Poe House curator, who has watched the ritual for 15 years. "It was mesmerizing watching this guy." The stranger, dressed entirely in black, did not creep into the rear of the cemetery to the site of Poe's original grave. Instead, he strode up to the monument at the front of the church, where Poe was reburied in 1875, drank a long toast, then bent over and kissed the relief image of the poet carved into the monument. Then, as quickly as he swept in, he left. "This guy looked sinister, but when he went to the Poe monument it was just a tender and touching moment to see this dark, brooding figure do something so touching." Jerome said. The three roses are thought to represent the poet, his wife, and her mother. All are buried in the tiny, brick-walled cemetery. Poe, who died after he was found wandering deliriously through the streets of Baltimore, is best-known for his bleak tales of horror, such as "The Raven," and "The Telltale Heart." The identity of the visitor dressed in black topcoat and fedora has remained a riddle. since the ritual began in 1949, a century after Poe died. The aging visitor believed to be the original carried on the tradition until 1993, when he left a cryptic note saying, "The torch will be passed." Then a younger man took up the task, apparently until this year. A combination of wiliness and respect keeps Poe devotees from trying to uncover the man's identity. Jerome said the mystery has a charm no one wants to ruin. While Jerome waits every year to watch from a distance, many other observers give up before the stranger arrives, usually sometime before 6 a.m. Jerome makes anyone watching with him promise not to interfere. This year a group of revelers arrived at midnight to sing "Happy Birthday'' to the scribe, but left long before the stranger arrived. BALTIMORE (AP) -- A mysterious stranger clad in a three-quarter length black peacoat left roses and cognac at the grave of Edgar Allan Poe early Tuesday, continuing a tradition that began 50 years ago. About a dozen people waited inside and outside Westminster Church until the tall, unknown visitor made his arrival at the tiny brick-walled cemetery just before 3 a.m. EST. The stranger placed his hands on Poe's tombstone and appeared to pray. A moment later he was gone, leaving three roses and a bottle of cognac to mark the 190th birthday of the macabre author. The identity of the first mysterious visitor, who had been dressed in black topcoat and fedora, has remained a riddle since the ritual began in 1949, a century after Poe died. The aging visitor believed to be the original carried on the tradition until 1993, when he left a cryptic note saying, "The torch will be passed." His followers have agreed to carry on the anonymous annual tribute, said Jeff Jerome, curator of the Edgar Allan Poe House and Museum in Baltimore. "They said they would continue the tradition in his footsteps," Jerome said. "I don't want to say too much more because some of the note's contents are of a private nature. I'm not trying to be mysterious, but some of this has to remain with me because it may give a clue as to who it is." © 1999. The Holland Sentinel. In a tradition true to the spirit of the author famous for his eerie tales, no one knows the identity of the visitor or has ever guessed the origin or true meaning of the ritual at the grave where Poe lies buried alongside his wife Virginia and aunt Maria Clemm. This year, the stranger -- believed by some to be a son of the man who originated the ceremony in 1949 -- drank his toast at about 2 a.m. EST Wednesday, paused briefly with his hand on the obelisk tombstone and disappeared like the "dream within a dream" that was Poe's mournful image for the transience of human life. The crowd that usually gathers outside the churchyard's brick wall to catch a glimpse of the visitor was kept indoors by sub-freezing temperatures. BALTIMORE--A mysterious, black-clad stranger who pays yearly tribute to Edgar Allan Poe is a New York Giants fan. A 52-year-old tradition endured early Friday when an enigmatic man went into the cemetery behind the old Westminster Presbyterian Church and celebrated Poe's birthday by laying three red roses and a half-filled bottle of French cognac on the writer's grave. 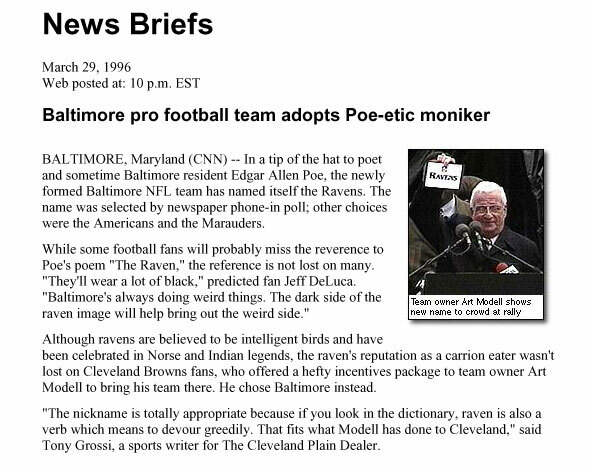 But some of the otherworldly quality was lost when the "Poe Toaster" dropped two details about himself: He's a football fan  and in the upcoming Super Bowl, he's not backing the Baltimore team named for one of Poe's best-known works. The anti-Ravens sentiment came as a shock to Jeff Jerome, curator of the Edgar Allan Poe House and Museum, who has watched the ritual each year for nearly two decades. "It just sort of burst a bubble for me," Jerome said. "I'm happy he showed up. I'm happy the tradition is going on, but it's taken a more earthly tone to it. "We all know it's not a ghost or a spirit or anything like that  but it's a human being who likes football?" The dark stranger materialized at 2:25 a.m. and approached the wordsmith's grave with his collar turned up against the rain and those who might reveal him. 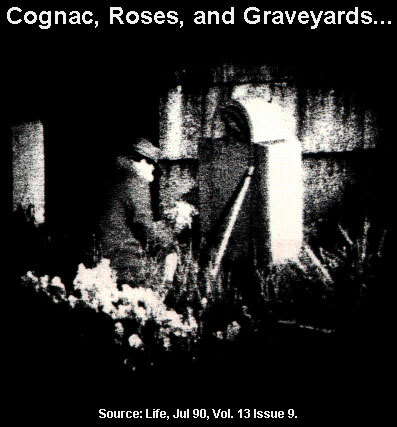 He placed the cognac and the roses on the ground, knelt for a moment, flashed two thumbs up and departed. The small band gathered for the man's visit found blue ribbon, red streamers and a sodden note tied to the cognac bottle. The significance of the adornments was lost on the Poe devotees until they examined the letter. Borrowing from Poe's "The Masque of the Red Death," the note read: "The New York Giants. Darkness and decay and the big blue hold dominion over all." Red and blue are the Giants' colors, and "the big blue" is a team nickname. The note continued with a reference from "The Cask of Amontillado": "The Baltimore Ravens. A thousand injuries they will suffer. Edgar Allan Poe evermore." Jerome added philosophically, "Even though he's rooting for the Giants, he still has respect for Poe. I hope he comes back next year, but I hope he doesn't make any kind of sports statement." Sue Cathcart, an English teacher from Dallastown Middle School in Pennsylvania, said the note didn't erode the mystique for her. "I was hoping it would be an excerpt from a short story or a poem  something deeper in meaning," said Cathcart, whose lessons include Poe's works. "I guess the athletic tone was very earthly, but it surely didn't take away from the excitement for me." The ritual began in 1949, a century after Poe's death. The original man in black handled the task each year until 1993, when he left a note saying, "The torch will be passed." Jerome said the younger men who have visited the grave since then are known to be the first man's sons. The roses are thought to represent the writer, his wife and her mother, all of whom are buried in the cemetery. The significance of the cognac has never been explained. Poe was known to be a heavy drinker, but there's no evidence that he was partial to cognac. Poe was born in Boston on Jan. 19, 1809, and spent much of his childhood in Richmond, Va., the place scholars say he most considered home. But he had strong ties to Baltimore, where he lived for several years during the early 1830s. According to the Edgar Allan Poe Society, the writer renounced Boston when asked where he was born and instead claimed Baltimore. He died at the age of 40 after he was found deliriously wandering the city's streets. Poe wrote everything from poetry to detective stories. But he is best known for such tales of horror as "The Raven" and "The Telltale Heart," which some credit with elevating the genre to new heights.